Hot on the heels of Friday's announcement about the sale of Gotta Go comes news of another sale at Moran Yacht & Ship, this time the 42.67m motor yacht Never Enough. Louis Dvorak at Ocean Alexander represented the buyer. 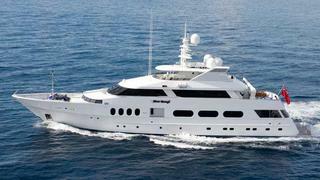 Launched by Feadship in 1992, she had an extensive refit in 2007, including a new paint job, to make her as good as new. She can accommodate 10 guests in five staterooms, with new soft furnishings and state of the art communication and AV equipment throughout. Her extensive array of water toys includes a new 32' Boston Whaler tender. Her asking price was $13.95 million.